Putlane Timothy Prince Trevor was born in Springs on the 26th July 1962 at 4:20am to Israel Lehlokoa Lengoasa and Rosemary Thandekile Lengoasa (nee Nkosi/Khumalo). He is the eldest in a family of seven and hence the many names as there was great excitement upon his arrival. Prince was raised all over South Africa as his parents became Salvation Army Officers (ministers) when he was just a toddler. Prince started school at Montshiwa LP School in Galeshewe village, Kimberly in 1968 to 1971. During his primary school days he took dancing classes and also was in the boy scouts. In that year (1968) he also started cornet classes given by his father and learned how to read music. His love for music began quiet early in his life and with the various appointments of his parents in and outside the borders of South Africa it gave him exposure to various types of music; different languages and cultures. The cultural diversity necessitated adaptability and humility in his character. He subsequently can speak all eleven official languages fluently and deal with people from all levels and different walks of life. Little did he know that the family circumstances are preparing and equipping him with leadership skills. It is said that leaders are born, not made. He was adept in learning his craft and became a section leader, which meant that he had to make decisions and face challenges, but it became a natural and rewarding process for him. Prince became a Salvation Army bandmaster for a number of corps and was appointed as music director and band master for the Salvation Army Territorial Band (a brass band of the Salvation Army church) for the Southern African region in 2002. At school when doing matric in the late seventies, Prince attended two schools that being Anchor High school and Molapo Technical College as he took Technical Drawing which was not offered at Anchor High. Such commitment for a teenager is rare and particularly during those times of unrests. He acquired a skill as a draughtsman, precision, artistic flair, calligraphy and being a perfectionist. You can just image what would happen if someone’s house plan is drawn incorrectly; the result would be absolute disaster! So, from 1981 to 1984 Prince worked for Industrial Electrical during the Soweto Electrification Project which was the first time Soweto was being electrified on a large scale. While working for Industrial Electrical, he was exposed to the effects of racism and job reservation according to race. This gave him a new energy of wanting to improve himself and further his music studies. He took lessons for cornet and theory privately as well as attending Amda at Dorkay house in Eloff street. During 1982 he took a break from work and went to the US to a Salvation Army music school and camp and studied more music which he had been pursuing by attending classes at Dorkay House and taking Theory lessons at AMDA. To this day Prince can sight read and write scores which clearly demonstrates that he has special talents. Those who have interacted with him will tell you that he is a perfectionist and has an impeccable dress sense. He does not know how to dress down! See him when doing his garden; you would swear that he is going to attend a meeting somewhere. He gives the soil and plants admirable attention and manages it accordingly. Gardening requires planning, care and understanding of seasons and plants. No matter how busy he may be he would make time for his garden. 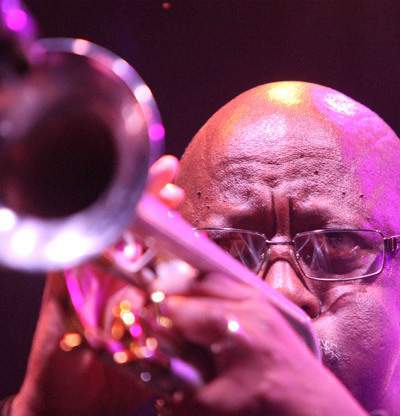 Trumpeter and singer: He is a freelance musician working in Jozi and the larger South Africa and the world as a teacher, arranger, composer, session muso, soloist, ensemble player, conductor and motivator to younger musicians. He appears on over 25 South African compact discs and recordings. He has worked with McCoy Mrubata as part of McCoy and friends for 11yrs, worked with Themba Mkhize on projects and recordings as a side-man as well as co-music director. He also worked with Caiphus Semenya and Letta Mbulu, Sibongile Khumalo, Hugh Masekela, Jonas Gwangwa and Khaya Mahlangu to name a few. Prince is comfortable conducting brass, choir, big-band or orchestra and listens and plays various types of music: jazz, classics, gospel, kwaito, world- music and mbaqanga. Music director: Directed an ensemble for the Inaugration of President Mbeki and played in the ceremonial big band under the leadership of Caiphus Semenya. Directed and supervised a big band at Sun City for Bob Mintzer under the Jazz Foundation and conducted the Jazz Meets Symphony with Themba Mkhize. He also directed a big band for Ann Hampton Carlaway. In addition Prince co-directed and coordinated the Colin Cowie new year’s bash for Oprah Winfrey at Sun City and participated as a trumpeter. Theatre involvement: He wrote music for various plays: Kweku Anansi, Sweat (Isithukuthuku); which were staged in Grahamstown. Antwurp, Oslo and Atlanta. Composed music and directed plays: Nkosi the Healing Song which was performed at the Wits Great Hall and recorded for television and he also wrote music for Baby Come Duze and Lakutshonilanga. Directed Isithukuthuku in Atlanta Georgia; teaching American actors South African songs under the directorship of Walter Chakela and participated in the fund-raising dinner for PHELO-PHEPA the health train in New York City as Louis Armstrong. Teacher: Prince taught trumpet theory and ensemble at the Alexander Arts Centre for two years; worked for Fuba (Federated union of Black Artists) and taught music at Pelmama Technical College. He has taught brass band and choirs in church for over 25 years as part of his worship and ministry. He is still teaching a brass band on part time basis at Park Town Boys High school, an engagement he has had for the past seven years. When asked about his character, he says: “To share a glimpse of me I would say my personality is like a narrow entrance hall to the great room that is my true nature. I am a highly independent, dependable and self-sufficient person. I am not the one to attract people on the basis of warmth or compassion though I am loaded with both. I am spiritual and religious with my very own ideas regarding the purpose of life and the Creator. An inspired speaker, but only when discussing subjects that really interest me, I am certainly not one for chatter. I believe in strong family values where love and respect are the center of all relationships. It gratifies me greatly to contribute in the well-being of others as it emphasizes the spirit of Ubuntu”.